We're hearing a lot these days about how the old Mustang compares to the new Mustang, but the question is, what really is an "old" Ford Mustang, or a "New" one? An old Ford Mustang and a classic Mustang sometimes mean the same thing too, so it can get confusing. Generally, it comes down to styling and when describing the style of old Mustangs, it's the classic 1965 to 1970 shape. And that usually means, long nose, short back and a power bulge over the rear wheelwells. 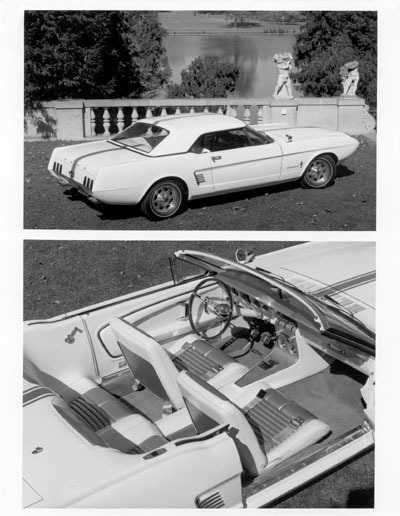 That profile, dictated by then Ford Vice President, Lee Iacocca, included seating for four, a floor mounted shifter, front bucket seats and a weight of 2,500 lbs. That classic silhouette, spawned the entire breed of pony cars. Not just the Ford Mustang, but it's Big Three competitors, including the classic Chevy Camaro, Dodge Challenger and Plymouth Cuda. 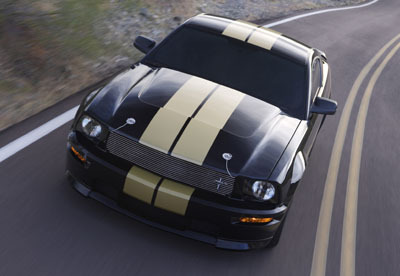 Over the past 45 + years, it's been symbolic of descriptions, such as pony car, muscle car,Shelby and others. Ford went through some rough times with Mustang styling and performance and at some times seemed to lose their way. But every time things seem to look bad for the iconic pony car, a return to old Mustang styling seems to rekindle the fire. That's still the story. Although, Ford's second last attempt in the mid 1970's to bring back older Mustang styling cues, was not in some people's minds a success, with the venerable Mustang ll, it did increase sales. And it's lack of power has been easily fixed by a new generation, with the addition of inexpensive hot rod parts. The big news these days, of course is the "New Mustang" or fifth generation Mustang, which emerged from a 2003 Mustang concept car which changed very little from concept to finished product as a 2005 Ford Mustang. As has always been the success formula, old Mustang styling became new Mustang styling cues. Even with only a casual glance at any 2005- 2010 Ford Mustang, the old Mustang styling is easily recognizable. The front end styling, with it's long hood and late 60's nose treatment bring back the look of the 1965 to 1970 cars. The side profile still includes the iconic sculptured "scoop" area behind the driver's door and at the rear, we see a new take on the original tail lights. 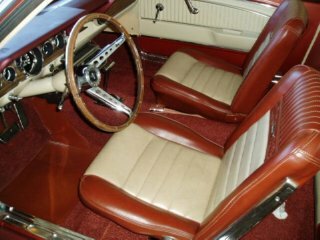 One look at the interior of a classic Ford Mustang and compare it to a new Mustang and you'll get a feeling of deja vu. Classic styling stays classic, and Ford's not messing around any more. Yes, the new Mustangs are modern in and out, but retain that evolutionary look and feel. While Carroll Shelby may be responsible for turning "Ford's secretary's car" into a performance car, the original Mustang was no slouch. With over 200 horsepower and only 2,500 lbs, it was a snappy performer. Adding a big 4 barrel carburetor, high flowing intake manifold, performance camshaft and dual exhaust changed it into a real "muscle Car" and as they say, the rest is history! The New Mustang continues on where the old Mustang left off. horsepower numbers, rival and even exceed the heady big block factory performance car days, while overall sophistication and amazing drag strip numbers make most of the originals look slow by comparison. Handling and stopping power, gas mileage and safety, however take the little pony car to levels not available even to many full on race cars in the 1960's. So no matter your preference, you can still have your old Mustang any way you like it.